The first month of summer is past now and I thought I’d do a little update on what we foraged in June this year. This might not include everything, but these were the major foods. The wild asparagus season wrapped up here in Minnesota around the second week of June. All total, we harvested about 65 pounds. Daryl got most of it, but Victoria helped a lot and Jack and Alex found their fair share. We generally freeze most of our asparagus (flash freeze on cookie sheets until frozen and then bag it, so it’s individually frozen and easy to scoop out later). Thinner, tender spears are frozen whole to grill or broil later, while the others are chopped. Blanch them first in boiling water for 2-3 minutes, then shock them in cold water and spread on cookie sheets. This locks in the color and nutrients. My favorite ways to cook with asparagus are to saute them in butter (often with mushrooms) and serve on rice, to use them in stir fries, and to broil them with just olive oil and kosher salt. They’re also wonderful grilled (again, with olive oil and salt). Less tender stuff makes a wonderful cream of asparagus soup, but don’t bother trying to make soup with truly woody parts. You can use those for broth. Here’s a bit more about how to process and use asparagus. Daryl and the boys brought home several good batches of cattail shoots, which are great early in the season. He processes our cattails so I’ll let him write up how to do this best. 🙂 I recommend Euell Gibbons’ “Stalking the Wild Asparagus” for good info on how to forage cattails. Daryl and Fiona have gathered about gallon or two of gooseberries so far (the season is just getting started), which is the most we’ve ever picked. They have to fight the thorns and then Daryl processes them (removes the ends) while he’s waiting around at rehearsal for the Wilder Pageant (an outdoor production that most or family takes part in every summer in nearby Walnut Grove). How we used them: We’re making gooseberry liqueur with a lot of them. The rest will be used with other fruits in jellies, syrups and country wines, and some will be frozen to be added to recipes throughout the year. Their sourness is perfect to balance wild foods like elderflowers and mulberries. I picked lots of lambs quarters from the yard for cooking in June. These weeds volunteer in gardens and yards all over, and they’re super tasty and healthy. I’m also letting some go to seed to try harvesting those this year, since they’re related to quinoa. I used them in lots of stir-fries and also made creamed lambs quarters soft tacos for lunch one day after finding the recipe. Fiona scarfed them up but the rest of us weren’t that impressed, so I’ll stick to other uses from now on. They are absolutely delicious in so many other ways (use them anywhere you’d use spinach). We especially like them in green smoothies, too. You can chop and blanch them and freeze them like spinach for use throughout the year, too. We just use this for on-the-spot relief for nettle stings, mosquito bites and such. Pick a clean leaf and chew it slightly, then apply it to the rash or sting. Relief comes soon after. Fiona has been self-healing her stings and rashes since she was 3 or 4 with plantain. It’s a great plant for kids to know and it grows just about everywhere! Jewelweed is another super helpful wild plant for skin ailments, especially poison ivy. If you get into something like poison ivy or stinging nettles in the wild, split the hollow stems open and apply the aloe-like gel to the area (wash areas exposed to poison ivy with water and dish soap or another oil-busting soap once you get home and you should avoid a rash). Jewelweed is also a favorite of humming birds once it blooms. I let some of this volunteer weed stay in my back yard since it’s so handy for skin ailments too. I accidentally got into some wood nettle (a relative of stinging nettle that also stings) in the back yard while clearing brush, and I split open the stem of a couple of jewelweed plants and rubbed the aloe-like juice on my arms and legs. The sting was gone soon after. Jewelweed is also commonly used in poison ivy remedies. Some people make decoctions and freeze them in ice cube trays for year-round relief for skin reactions. Daryl scored major points by finding our first ever batch of chicken of the woods mushrooms, which I’ve wanted to try for years. They did not disappoint! It’s unreal how much the taste, texture and appearance is like chicken. A friend told me she saw them on sale at her local market for $22.50 a pound, so the ten pounds he brought home would have cost $225! I can see what the fuss is about, and they are my all-time favorite vegetarian meat substitute now. I sauteed and froze the bulk of it to use in dishes throughout the year. I’ve also used it for several dishes already — breaded and fried one night, stirred into a rice casserole, and in chicken (of the woods) fried rice. I also made a batch of BBQ chicken (of the woods) jerky that tastes crazy good. I’ll post the recipe for that soon if anyone is interested. Here’s lots of info on how to process chicken of the woods. Of course I’m thrilled that elderflower season has begun! We let most of them develop into elderberries, but we tend to gather lots of elderflowers if we’re at a spot where we won’t be around to forage the berries later or if there are just tons of them. I dried most of them this season because they are so good for teas that help cure colds, flus, coughs and allergy symptoms. The tea is also just plain tasty. I also made a big batch of elderflower liqueur and another batch of elderflower tincture and 8 half pints of elderflower rhubarb jam (recipe in my elderberry book), some of which was wonderful in cream puffs with whipped cream. Next up is elderflower syrup. You know we also love elderflower soda so that will be on the agenda too. I’m also using some of the flowers to make a wild yeast starter, since elderflower and elderberries are so full of wild yeast for country wines and wild beers. We get the bulk of our black raspberries from our own back yard (which was seeded with 3 little black raspberry runners we transplanted from the wild about 8 years ago), but we’re also gathering black raspberries from nearby parks. We eat tons of them fresh out of hand, but also flash freeze and bag some for later in the year. These will be used for smoothies, syrups, country wine, jam, etc. Daryl and Victoria have been doing most of the mulberry harvesting. Victoria and her fiance are now in their own house just a half a mile from us (a very small fixer upper in need of lots of TLC purchased for $4k cash) but she goes along on foraging expeditions with Daryl often because she still loves wild foods and free food is always a good thing when you’re a struggling young couple. 🙂 Mulberries are some of her favorite wild foods so she goes along any time Daryl offers to come pick her up. They harvest from a local county park, and get mostly red mulberries and some white. We eat lots fresh and also flash freeze and bag up some to use throughout the year in smoothies and fruit leather. 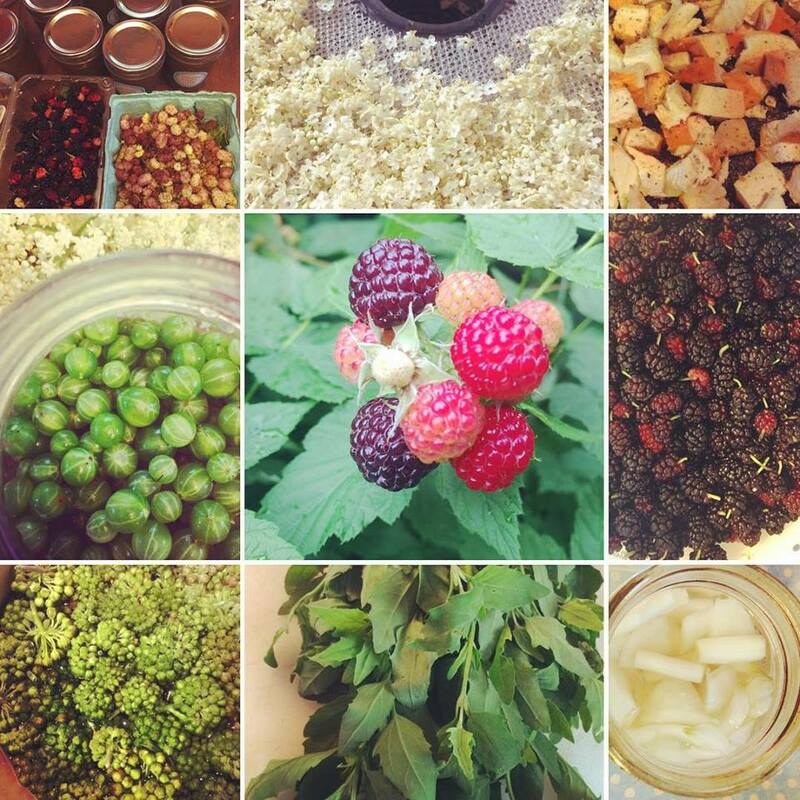 Here are lots of other wonderful ways to use mulberries. Other foods we foraged included spruce tips, garlic mustard, wild onions, milkweed buds and probably more that I’ve forgotten. 🙂 Those were the biggies though. We also had a lot of perennial goodies from our yard in June, like cherries, chives, mint and rhubarb. And the garden is getting started and should be producing lots soon. What have you been foraging or harvesting lately? Are you absolutely sure that your trees are red mulberry in Minnesota? Some people don’t know that white mulberry trees usually have red or black colored fruit. White colored fruit is the exception on white mulberry trees. Red mulberry trees are Minnesota’s rarest wild tree. We have very few of them in Iowa too. I’ve only seen one of them ever, but white mulberry trees are all over.